2010-07-08 First worldwide family litigation filed litigation Critical https://patents.darts-ip.com/?family=28457140&utm_source=google_patent&utm_medium=platform_link&utm_campaign=public_patent_search&patent=US20030232944(A1) "Global patent litigation dataset” by Darts-ip is licensed under a Creative Commons Attribution 4.0 International License. Methods for making biomaterials for augmentation of soft and hard tissues, kits containing precursors for forming the biomaterials, and the resulting biomaterials are described herein. The biomaterials are formed from at least a first and a second precursor component. The first precursor component contains at least two nucleophilic groups, and the second precursor component contains at least two electrophilic groups. The nucleophilic and electrophilic groups of the first and second precursor components form covalent linkages with each other at physiological temperatures. The precursors are selected based on the desired properties of the biomaterial. 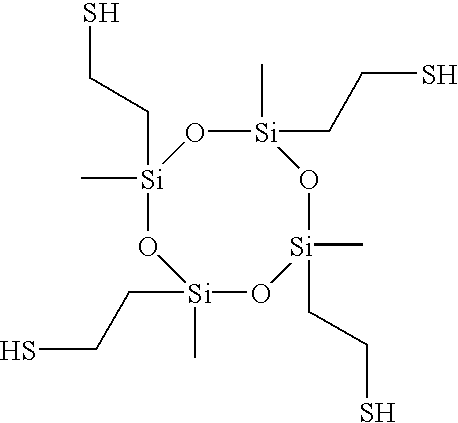 In the preferred embodiment, the first precursor is a siloxane. 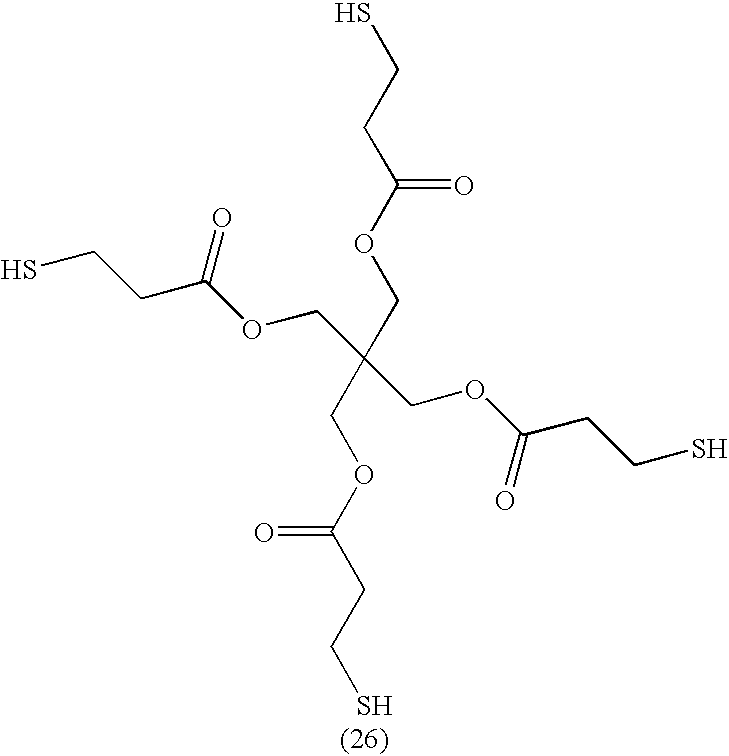 Optionally, the biomaterials contain additives, such as thixotropic agents, radiopaque agents, or bioactive agents. In the preferred embodiment, the biomaterials are used to augment at least one vertebra of the spine (vertebroplasty). This application claims priority to U.S. Application No. 60/366,712, filed Mar. 22, 2002, entitled “Compositions for Tissue Augmentation” to Aaldert Rens Molenberg, Daniel Fehr, and Nicola Tirelli and to U.S. Application No. 60/408,077, filed Sep. 4, 2002, entitled “Compositions for Tissue Augmentation” to Aaldert Rens Molenberg, Daniel Fehr, and Nicola Tirelli. Vertebroplasty is a very effective treatment for compression fractures. It relieves pain in the majority of cases by preventing the micro-movement of the spongy tissue structure inside the vertebra and providing mechanical stabilization of existing microfractures (Mathis J. et al.,  Am. J. Neuroradiol. 22: 373-381 (2001)). The risk factors and problems in vertebroplasty are mainly associated with the toxicity of methylmethacrylate. The highly toxic methylmethacrylate may leach out into the blood stream before it is crosslinked sufficiently, causing blood pressure drop and migration of the bone cement into the veins with the possibility of ending up in the lungs or causing hypotension. Although this is a risk common to all uses of PMMA, it is increased in vertebroplasty due to the fact that PMMA is injected under pressure into a closed space inside fractured bone. This increases the risk for leakage. The exothermic polymerization process is a further deficiency of PMMA since it often leads to substantial damage of the surrounding tissue. Thus, PMMA is far from the ideal biomaterial for hard tissue augmentation, in general, and for application in vertebroplasty, in particular. Even after successful injection and polymerization, PMMA can cause complications. PMMA is very hard and can cause stress-shelding and/or collapse of the vertebrae adjacent to the treated vertebra which then may fracture as well. (Ferguson S. et. al,  Transactions of the 47th Annual Meeting of the ORS, 0280 (2001)). FIG. 1 a shows a comparison of Young's modulus (MPa) between a control and an augmented group of vertebrae for both low and high volume fractions (VF) (* p<0.05). “Conjugation” can refer both to alternation of carbon-carbon, carbon-heteroatom or heteroatom-heteroatom multiple bonds with single bonds, or to the linking of a functional group to a macromolecule, such as a synthetic polymer or a protein. Double bonds spaced by a CH or CH 2 unit are referred to as “homoconjugated double bonds”. “Crosslink density” is defined as the average molecular weight between two crosslinks (M c) of the respective molecules. “Strain” is change per unit length in a linear dimension of a part or specimen, usually expressed in % strain based on original length of the specimen (ΔL/L o). True or natural strain is based on instantaneous length, and is equal to ln×lo, where I is instantaneous length and lo is original length of the specimen. Shear strain is the change in angle between two lines originally at right angles. The nucleophilic groups may be contained in molecules with great flexibility in overall structure. 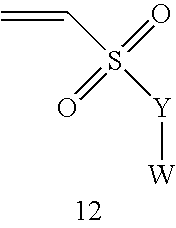 For example, a difunctional nucleophile could be presented in the form of Nuc-P-Nuc, where P indicates a monomer, oligomer or polymer and Nuc refers to the nucleophile. 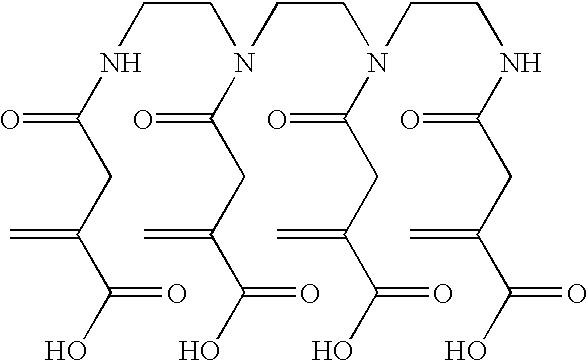 Likewise, a branched polymer, P, could be derivatized with a number of nucleophiles to create P-(Nuc) i., where I is greater than 1. The nucleophile could be part of the repeating structure, e.g. (P-Nuc)i. Clearly, not all of the P or the nucleophiles in such a structure need to be identical. where n=3-6, preferably 4; R 1=alkyl, preferably C1-C6-alkyl; and R2″=alkyl, preferably C2-C3-alkyl; X=—SH, —NH2. These molecules contain a nearly ideal combination of characteristics which are desired for the intended use of hard tissue augmentation. They are small, compact, and hydrophobic with a high degree of functionality. Particularly preferred is 2,4,6,8-Tetra(2-mercaptoethyl)-2,4,6,8-tetramethylcyclotetrasiloxane; using the above formula, n=4; R 1=CH3; R2″=C2H4; X=—SH (21). where n=6; R 1=H, alkyl preferably C1 to C4, R2″=alkyl, preferably C1 to C4 alkyl; and X=—SH. The most preferred derivative is 1,2,4-Tris (2-mercaptoethyl)-cyclohexane; using the above formula, n=6; R1=H; R2″=C2H4; X=—SH. (22). Structures such as 1a, 1b and 2 are based on the conjugation of a carbon-carbon double bond with one or two electron-withdrawing groups. One of them is always a carbonyl, increasing the reactivity passing from an amide, to an ester, and then to a phenone structure. The nucleophilic addition is easier upon decreasing the steric hindrance, or increasing the electron-withdrawing power in the alpha-position. For example, the following relationship exists, CH 3<H<COOW<CN, where CH3 has the least electron-withdrawing power and CN has the most electron-withdrawing power. The activation of double bonds to nucleophilic addition can be obtained by using heteroatom-based electron-withdrawing groups. In fact, heteroatom-containing analogues of ketones (11, 12), esters and amides (13, 14) provide similar electron-withdrawing behavior. The reactivity towards nucleophilic addition increases with electronegativity of the group. Thus the structures have the following relationship, 11>12>13>14, where II is the most electronegative and 14 is the least electronegative. The reactivity towards nucleophilic addition is also enhanced by the linkage with an aromatic ring. A strong activation of double bonds can also be obtained, using electron-withdrawing groups based on aromatic rings. Any aromatic structure containing a pyridinium-like cation (e.g., derivatives of quinoline, imidazole, pyrazine, pyrimidine, pyridazine, and similar sp 2-nitrogen containing compounds) strongly polarizes the double bond and makes possible quick Michael-type additions. (A) Two step synthesis via chlorination reaction: Saponification of dialkylitaconate to 1-alkyl-4-hydrogen itaconate in the presence of an organic acid. Chlorination of 4-hydrogen-1-methyl itaconate to 1-methyl itaconyl chloride with e.g. SOCl 2. Reaction between 4-hydrogen-1-methyl itaconate and X—OH (X—OH=1,1,1 tris(hydroxymethyl)propane, pentaerithritol and triglycerol) to the itaconyl derivatives of X—OH. The composition further can contain radiopaque agents in order to track the performance of application and to instantaneously detect potential leakage. The detection of leakage is, especially in vertebroplasty, of importance as described hereinbefore. The radiopaque agents can be of organic or inorganic nature. In a preferred embodiment, barium sulfate (BaSO 4) is used as radiopaque X-ray contrast agent, preferably in a range of between 4 weight % to 30 weight % of the weight of the total composition, preferably in a range of between 5 to 20 weight %, and even more preferably in a range of between 6 to 10 weight %. Preferably the BaSO4 has a specific surface area of greater than or equal to 25 m2/g and a particle size (diameter) of less than or equal to 100 μm (d50). In another preferred embodiment, zirconium oxide (ZrO2) is used as the X-ray contrast agent. The applicable weight percentages are in the same ranges as for BaSO4. Apart from their function as thixotropic and X-ray contrast agents, silica, zirconium oxide and barium sulfate serve as fillers in the composition. The addition of fillers result in an increase of the mechanical properties (ultimate compressive strength and Young's modulus E) of the biomaterial compared to the mechanical properties of the polymeric network. 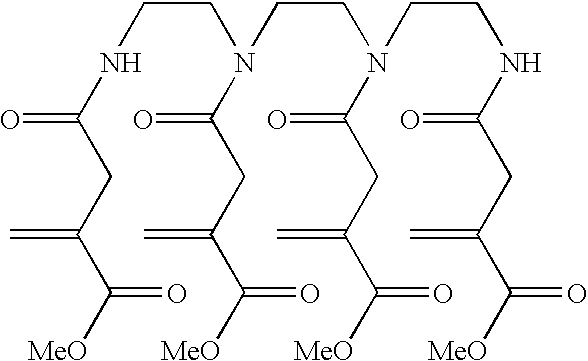 For example, the Young's modulus E of a polymeric network of 2,4,6,8-Tetra(2-mercaptoethyl)-2,4,6,8-tetramethylcyclotetrasiloxane and 1,1,1-tris(hydroxymethyl)propane-tris(1-methyl itaconate), in an equivalent weight ratio of 1 (equivalent weight of double bonds to thiol groups), almost doubles by the addition of 25 weight % fillers (SiO 2 and BaSO4 and/or ZrO2). 102.1 g (0.65 mol) of dimethyl itaconate and 35.0 g (0.18 mol) of toluene-4-sulfonic acid monohydrate were dissolved in 50 ml of water and 250 ml of formic acid in a 1000 ml round bottom flask, equipped with a reflux condenser, a thermometer, and a magnetic stirring bar. The solution was brought to a light-reflux by immersing the flask in an oil bath at 120° C. and was stirred for 45 min. Then, the reaction was quenched by pouring the slightly yellow, clear reaction mixture into 300 g of ice while stirring. The resulting clear aqueous solution was transferred to a separation funnel and the product was extracted with three 200 ml portions of dichloromethane. The combined organic layers were dried over MgSO 4, and the solvent was removed by rotary evaporation, yielding 64.5 g of raw product. Extracting the aqueous layer once more with 200 ml of dichloromethane yielded another 6.4 g of raw product. A typical acidic smell indicated the presence of some formic acid in the fractions, which was removed by dissolving the combined fractions in 150 ml of dichloromethane and washing twice with 50 ml of saturated aqueous NaCl solution. Drying the organic layer with MgSO4 and evaporating the solvent yielded 60.1 g of a clear and colorless oil, which was distilled under reduced pressure, yielding 55.3 g of a clear and colorless oil. According to 1H NMR analysis the product consisted of 4-hydrogen-1-methyl itaconate (91%), 1-hydrogen-4-methyl itaconate (ca. 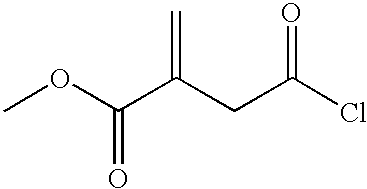 5%), and dimethyl itaconate (ca. 4%). 176 g (1.15 mol) of dimethyl itaconate were dissolved in 90 ml of water and 318 ml of formic acid and the mixture was heated to 60-65° C. and stirred at reduced pressure (300-250 mbar) for 4 days. After four days, GC analysis showed a conversion of 71.5%. Then, the pressure was reduced to 200-100 mbar and 170 ml of solvent was distilled off. The reaction mixture was cooled to 20° C., diluted with 350 ml water and 710 ml saturated aqueous NaCl solution, and extracted with three 350 ml portions of dichloromethane. The combined organic layers were concentrated to 15% of their original volume and 1.06 l of saturated aqueous NaHCO 3 solution was added while stirring. The organic layer containing 28.7 g of unreacted dimethyl itaconate was discarded, and the aqueous layer was extracted with three 350 ml portions of dichloro-methane, removing another 3.5 g of unreacted dimethyl itaconate. The aqueous layer was reacted with 140 ml of 32% aqueous HCl and extracted with three 350 ml portions of dichloromethane, which, upon evaporation of the solvent, yielded 89.8 g (55%) of 4-hydrogen-1-methyl itaconate in 98.3% purity (GC). 7.14 g (46 mmol) of 4-hydrogen-1-methyl itaconate were weighed into a 50 ml two-neck round bottom flask, equipped with a reflux condenser, a septum and a magnetic stirring bar. 5 ml of dry diethyl ether, 1 drop of pyridine and 5 ml (69 mmol) of thionyl chloride were added. T he resulting solution was brought to reflux and stirred for 15 min. Then the oil bath was removed and a light argon stream was led through the reaction mixture in order to remove HCl and SO 2. The last traces of these gases and the solvent were removed by distillation under membrane pump vacuum. The resulting yellow oil was distilled under reduced pressure. A clear and colorless oil distilled at 66-68° C./8-9 mbar. 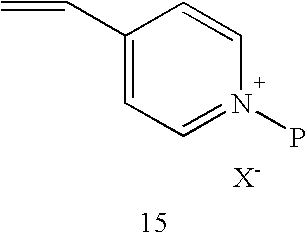 The IR spectrum showed carbonyl bands for a saturated acid chloride (1804 cm−1) and a conjugated ester (1724 cm−1). 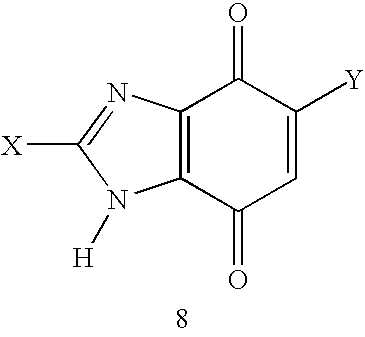 1H NMR analysis showed the product to consist of 1-methyl itaconyl chloride (89%), 4-methyl itaconyl chloride(ca. 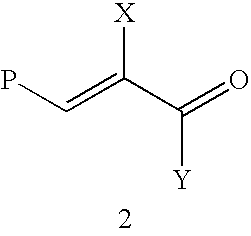 4%), and dimethyl itaconate (ca. 7%). See H.-Z. Pan, Y. Yan, L. Tang, Z.-Q. 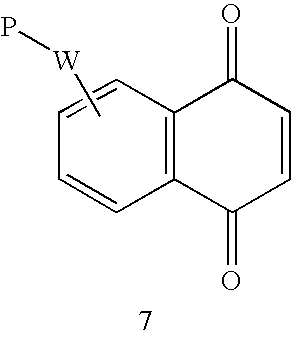 Wu, F.-M. Li, Macromol. Rapid Commun. 21, 567-573 (2000). 2.64 g (19.7 mmol) of 1,1,1-tris(hydroxymethyl)propane was dissolved in 20 ml of dry 1,4-dioxane and 55 ml of dry dichloromethane were added. The solution was cooled with an ice bath and 10.4 g (64.1 mmol) of 1-methyl itaconyl chloride in 5 ml of dry dichloromethane were added dropwise in 2 min. and the mixture was stirred for 10 min. Then, 7.10 g (70.2 mmol) triethylamine dissolved in 20 ml of dry dichloromethane were added at such a rate that the temperature of the reaction mixture remained below 5° C. (ca. 45 min.). After addition was complete, stirring was continued for 1 hr., after which the ice bath was removed and the reaction mixture brought to a mild reflux and was stirred for another hour. Then the ammonium salts were removed by filtration over ca. 1 cm of neutral Al 2O3 and the solvents were rotavaped off the filtrate. The oil was dissolved in diethyl ether and washed with 50 ml of 3% aqueous HCl, twice with 50 ml of saturated aqueous NaHCO3, and once with 50 ml of water. The organic layer was dried with MgSO4 and the solvent was removed by rotary evaporation and 18 mg of MEHQ were added. The resulting greenish brown, clear oil was purified by column chromatography over silica gel (column height ca. 45 cm, ø 5 cm, eluent hexane/ethyl acetate 1/1 @ 16-18 ml/min.) The product was recovered as a pale yellow oil, yield 5.49 g (55%). 7.14 g (0.053 mol) of 1,1,1-tris(hydroxymethyl)propane, 30.03 g (0.190 mol) of dimethyl itaconate, 9.19 g (0.048 mol) of toluene-4-sulfonic acid monohydrate, and 56 mg of 2,6-di-tert-butyl-p-cresol were weighed into a 100 ml round bottom flask, equipped with a Dean Stark trap. The flask was heated to 100° C. and methanol was distilled off under reduced pressure. After 6 hrs. the reaction mixture was dissolved in 25 ml of toluene and the volatiles were removed by rotary evaporation. The resulting clear, amber colored mixture was poured into 60 ml of 1 M aqueous NaHCO 3 and 100 ml of diethyl ether were added to dissolve the product. The organic layer was washed with 60 ml of 1 M aqueous NaHCO3 and 60 ml of water, dried with Na2SO4 and the solvent was removed by rotary evaporation, yielding 27.5 g (86%) of raw product. 14.3 g of the raw product were purified by column chromatography over Silicagel 60 with 2/1 hexane/ethyl acetate as eluent. After the excess of dimethyl itaconate had eluted, the eluent was changed for a 1/1 hexane/ethyl acetate mixture and 4.48 (31%) of 1,1,1-tris(1-methyl-itaconoxymethyl)propane were recovered. 1.25 g (5.2 mmol) of triglycerol, 5.41 g (36.0 mmol) of 4-hydrogen-1-methyl itaconate, and 0.45 g (3.6 mmol) of 4-(dimethylamino)-pyridine were dissolved under an Ar atmosphere in 20 ml of dry chloroform and cooled to 1° C. 7.09 g (36.9 mmol) of N-(3-dimethylaminopropyl)-N′-ethylcarbodiimide hydrochloride was dissolved in 40 ml of dry chloroform and added dropwise at such a rate that the temperature of the reaction mixture remains <5° C. Then the reaction mixture was allowed to slowly warm up to room temperature and stirred overnight. The resulting clear, yellow solution was washed with 50 ml of saturated aqueous NaHCO 3 solution, 50 ml of 1 M aqueous KHSO4 solution, 50 ml of saturated aqueous NaHCO3 solution, and 50 ml of saturated aqueous NaCl solution, dried over MgSO4, and filtered over ca. 3 cm of silica gel and Celite 545. Evaporation of the solvents yielded 2.56 g (57%) of the desired product. IR analysis confirmed the complete conversion of the OH groups. M=870.78; 5.74 meq/g C═C. 104.7 g (0.43 mol) of di-n-butyl itaconate and 3.93 g (0.021 mol) of toluene-4-sulfonic acid monohydrate were dissolved in 140 ml of formic acid in a 500 ml round bottom flask, equipped with a reflux condenser, a thermometer, and a magnetic stirring bar. 30 ml of water were added and the resulting solution was heated to 66° C. by immersing the flask in an oil bath at 72° C. and was stirred at that temperature for 48 hrs. Then, the reaction was quenched by pouring the slightly yellow, clear reaction mixture into 600 ml of ice water while stirring. The resulting light yellow emulsion was transferred to a separation funnel and the product was extracted by washing three times with 200 ml of dichloromethane. The combined organic layers were washed with 100 ml of saturated aqueous NaCl solution and dried over Na 2SO4.Removal of the solvent by rotary evaporation yielded 75.3 g of raw product. According to 1H NMR analysis the raw product consisted for 81% of 4-hydrogen-1-n-butyl itaconate, for ca. 4% of 1-hydrogen-4-n-butyl itaconate, and for ca. 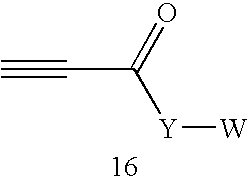 15% of di-n-butyl itaconate. To the raw product 250 ml of saturated aqueous NaHCO3 solution and 17.6 g of NaHCO3 were added, yielding a hazy, red solution, which was washed 3 times with 100 ml of diethyl ether. To the clear, red aqueous layer KHSO4 was added until the pH has dropped from 8.5 to 3.0 and it was washed twice with 100 ml of dichloromethane. Then more KHSO4 was added until the pH value is 2.2 and the solution was washed again twice with 100 ml of dichloromethane. The yellow organic layer was washed with 50 ml of saturated aqueous NaCl solution and dried over MgSO4. Evaporating the solvent yielded 53.6 g (67%) of a clear, yellow oil, which, according to 1H NMR analysis, consisted for 95% of 4-hydrogen-1-n-butyl itaconate and for ca. 5% of 1-hydrogen-4-n-butyl itaconate. 2.00 g (14.9 mmol) of 1,1,1-tris-(hydroxymethyl)-propane, 11.3 g (59.0 mmol) of N-(3-dimethylaminopropyl)-N′-ethylcarbodiimide hydrochloride, and 0.43 g (3.5 mmol) of 4-(dimethylamino)-pyridine were suspended in 150 ml of dry dichloromethane under an Ar atmosphere. The suspension was cooled to 1° C. and 9.65 g (51.8 mmol) of 4-hydrogen-1-n-butyl itaconate dissolved in 80 ml of dry dichloromethane were added dropwise at such a rate that the temperature remains below 2° C. After complete addition the clear, yellow reaction mixture was allowed to warm up to room temperature and stirred for another hour. After filtration and removal of the solvent, 100 ml of diethyl ether were added and the solution was washed with 50 ml of saturated aqueous NaHCO 3 solution, 50 ml of 3% hydrochloric acid, and 25 ml of saturated aqueous NaHCO3 solution with 25 ml of water. Drying the organic layer with MgSO4 and evaporation of the solvent yielded 7.93 g (80%) of the product as a reddish brown oil. Molecular weight 638.75 g/mol; 4.70 meq/g. 5.4 ml (74 mmol) of thionylchloride were added slowly to 100 ml of ice cold methanol. This mixture was added to a slurry of 5.39 g (9.1 mmol) of N,N′,N″,N′″-tetrakis(1-hydrogen-itaconyl)-triethylenetetraamine. The resulting yellow suspension was brought to reflux and stirred for four hours, during which the reaction mixture became clear. Evaporation of the volatiles yielded 4.30 g (73%) of N,N′,N″,N′″-tetrakis(1-hydrogen-itaconyl)-triethylenetetraamine, as identified by IR and  1H NMR. molecular weight =659.68 g/mol; 6.15 meq/g C═C. 10.2 g (53.1 mmol) of N-(3-dimethylaminopropyl)-N′-ethylcarbodiimide hydrochloride and 0.40 g (3.3 mmol) of 4-(dimethylamino)-pyridine were suspended in 50 ml of dry dichloromethane under an Ar atmosphere. The suspension was cooled in an ice bath to 2° C. and 6.09 g of trimethylolpropane tns[poly(propyleneglycol), amine terminated] ether dissolved in 50 ml of dry dichloromethane were added, yielding a clear and colorless solution. 7.15 g (49.6 mmol) of 4-hydrogen-1-methyl itaconate dissolved in 40 ml of dry dichloromethane were added dropwise at such a rate that the temperature remains below 4° C. After complete addition the clear, light yellow reaction mixture was stirred for another hour at 2-3° C. and was then allowed to warm up to room temperature and stirred for one more hour. The solution was transferred to a separation funnel and washed with 50 ml of saturated aqueous NaHCO 3 solution, 50 ml of 1 M aqueous KHSO4 solution, and 50 ml of saturated aqueous NaHCO3 solution with 50 ml of saturated aqueous NaCl solution. Drying the organic layer with Na2SO4 and evaporation of the solvent yielded 12.8 g of the product as a clear, reddish brown oil, the structure of which is confirmed by IR, 1H NMR, and 13C NMR spectroscopy. 30.7 g (0.12 mol) of pentaerythritol triallylether was dissolved in 100 ml of dry THF and 4.4 g (0.18 mol) of NaH was added in small portions while stirring. After gas evolution had ceased, 16 ml (0.18 mol) of allyl bromide was added and the reaction mixture was stirred overnight at room temperature. In order to drive the reaction to completion, it was subsequently brought to reflux and stirred for 1 hr. The precipitated salts were removed by filtration over ca. 1 cm of Celite 545 and the solvent and excess allyl bromide were evaporated, yielding 35.3 g (99.5%) of a pale yellow oil. The raw product was dissolved in 100 ml of diethyl ether and washed subsequently with 50 ml of 0.1 M aqueous KHSO 4 and 50 ml of saturated aqueous NaHCO3 solution. Drying the organic layer with MgSO4 and evaporation of the solvent yielded 34.4 g (97%) of the pure product. 24.8 g (83.8 mmol)of pentaerythritol tetraallylether, 28.8 g (0.378 mol) of thioacetic acid, and 1.08 g (6.6 mmol) of AIBN were dissolved in 100 ml of THF, cooled to 2° C. and degassed by 3 cycles of evacuation and purging with Ar. The solution was brought to reflux and stirred for 17 hrs. Then, another 6.12 g (80.4 mmol) of thioacetic acid, and 0.51 g (3.1 mmol) of AIBN were added and the reaction mixture was stirred under reflux for another 22 hrs., after which the solvent was evaporated. Yield: 55.5 g (110%) of a yellow oil. According to  1H NMR analysis, 98.4% of the allyl groups had been converted. 7.02 g (0.011 mol) of pentaerythritol tetrakis(3-thioacetopropyl)ether was dissolved in 30 ml of ethanol. The solution was degassed by 3 cycles of evacuation and purging with Ar and heated in a 60° C. oil bath. 30.3 g (0.27 mol) of a 50% aqueous KOH solution was added dropwise in ca. 30 min. After another 30 min. stirring the reaction mixture was allowed to cool down, poured into 100 ml of degassed 1 M aqueous KHSO 4 solution and-brought to pH 2 by adding saturated aqueous KHSO4 solution. The product was recovered by extraction with three 80 ml portions of diethyl ether. The combined organic layers were washed subsequently with 100 ml of saturated aqueous NaHCO3 solution and 100 ml of saturated aqueous NaCl solution and dried over Na2SO4. Evaporating the solvent yielded 4.1 g (89%) of an amber colored oil. IR analysis showed the complete disappearance of the carbonyl signal at 1687 cm−1. 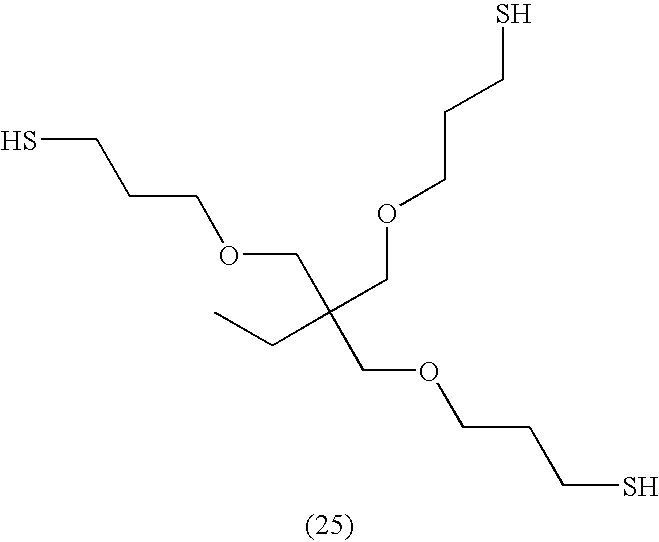 22.2 g (0.137 mol) of 1,2,4-trivinylcyclohexane, 37.2 g (0.49 mol) of thioacetic acid, and 1.4 g (8.5 mmol) of AIBN were dissolved in 140 ml of THF under an Ar atmosphere. The solution was brought to reflux and stirred for 18 hrs. After cooling down, the solution was stirred for 30 min. with Dowex WGR2 resin, in order to bind the excess of thioacetic acid and filtered. The solvent was removed by rotary evaporation and the product was dispersed in a solution of 79.3 g (1.98 mol) of NaOH in 170 ml of water under an Ar atmosphere. The dispersion was heated to 80° C. and stirred at that temperature for 4 hrs. After cooling to room temperature, concentrated hydrochloric acid was added slowly until the pH is 1 and the product was extracted with three 150 ml portions of dichloromethane. The combined organic layers were washed with 150 ml of 5% aqueous NaHCO 3 solution and with 100 ml of water and dried with MgSO4. Removing the solvent yielded 27.3 g (76%) of the desired product. 23.7 g (0.069 mmol) of 2,4,6,8-Tetravinyl-2,4,6,8-tetramethylcyclotetrasiloxane, 25.2 g (0.331 mmol) of thioacetic acid, and 0.91 g (5.5 mmol) of AIBN were dissolved in 1110 ml of THF and flushed with nitrogen. The reaction mixture was heated to reflux for 15 hrs., after which it was cooled down to 40° C. and the THF was distilled off at reduced pressure. The resulting oil was dissolved in 100 ml of ethanol and at room temperature 29 ml of 50% aqueous NaOH were added, causing the temperature to rise to 48° C. After the addition was complete, the mixture was heated to reflux for 4 hrs. and the mixture was concentrated to 25% of its original volume at reduced pressure. After cooling to room temperature, 187 g of 30% H 2SO4 in water were added slowly. The product was extracted from the mixture with three 100 ml portions of dichloromethane. The combined organic layers were washed twice with 180 ml of saturated aqueous NaHCO3 solution. Evaporating the solvent and drying on the rotavap at 10 mbar for 5 hrs. yielded 32.9 g (99%) of a viscous, yellow oil. Molecular weight =480.99 g/mol; 8.82 meq/g SH. 48 ml (0.224 mol) of trimethylolpropane diallyl ether was slowly added to 120 ml THF and 6.5 g (0.271 mol) of NaH in a 500 ml round bottom flask. Slow development of bubbles indicated the start of the redox reaction between R—OH and Na. The solution was stirred overnight. 23 ml (0.032 mol) of allyl bromide was dropped to the solution. Mixture got warm and milky and the suspension was left overnight. The solution was transferred into a separation funnel and the product was washed with H 2O, KHSO4, again H2O and NaCl. The organic layer was dried with MgSO4 and evaporated. 41 g (0.164 mol) of trimethylolpropane triallylether, 36.7 ml (0.59 ml) of thioacetic acid and 1.67 g of AIBN were dissolved in 150 ml of THF in a 500 ml round bottom flask, equipped with reflux condenser, thermometer and magnetic stirrer bar. The solution was stirred at 65° C. for 18 h. To bind thiacetic acid, 37 g of Dowex WGR-2 was added. After 30-40 min of stirring, the solution was filtrated and dried with MgSO 4. 15.5 g (0.138 mol) itaconic anhydride was dissolved in 100 ml CH 2Cl2. The solution was filtered to remove traces of insoluble itaconic acid and was slowly added to 75 ml (0.0375 mol) of Jeffamine D-2000 in 400 ml borate buffer (0.1 M, 9.5pH with NaOH) in a II round bottom flask, equipped with reflux condenser, thermometer, magnetic stirrer bar and dropping funnel. The pH was kept at 9.5 by addition of NaOH. After stirring the reaction mixture overnight, 200 ml of water was added and the resulting suspension was transferred to a separation funnel and the product was extracted by washing five times with 250 ml of diethyl ether and by washing two times with 200 ml of brine. The organic layer was dried over MgSO4 and the solvent was removed by rotary evaporation, yielding 63.1 g (76%) of product. 8.2 ml (0.112 mol) of thionyl chloride was slowly added to 100 ml of icecooled 1-propanol from a dropping funnel. 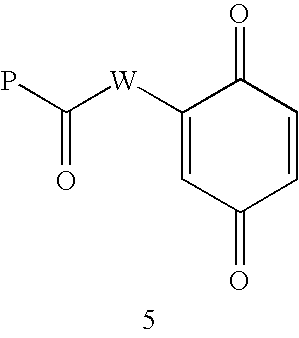 62 g (0.028 mol) of PPOdiItAm free acid, dissolved in 200 ml of primary alcohol, was added. Then the solution was brought to a light reflux and was stirred for 4 h. The solution was concentrated by rotary evaporation and 100 ml of chloroform was added. The solution was transferred to a separation funnel and the product was washed twice with 150 ml of saturated aqueous NaHCO 3 solution and twice with 150 ml of brine. The organic layer was dried with MgSO4 and the solvent was removed by rotary evaporation, yielding 49.8 g (81%) of the derived product. 100 ml (0.049 mol) of Jeffamine D-2000 and 11.4 g (0.107 mol) of Na 2CO3 were added to 200 ml chloroform in a 500 ml round bottom flask, equipped with reflux condenser, magnetic stirrer, thermometer and dropping funnel. 8.7 ml (0.107 mol) of acryloyl chloride, dissolved in 20 ml chloroform was added slowly to the solution and stirred for 2 days. The solution was filtrated and transferred to a separation funnel and the product was washed twice with concentrated aqueous NaHCO3 solution and twice with brine. The organic layer was dried with MgSO4, and the solvent was removed by rotary evaporation, yielding 72.3 g (68%) of slightly yellow oil. As used herein, the term “component” includes the reactive species and any additive added beforehand. For example, “thiol component” or “itaconate component” indicates the respective species of thiol or itaconate itself plus fillers, X-ray agents, bases such as SiO 2 or BaSO4 or triethylamine. 2 g of BaSO 4 and 0.74 g of SiO2 were dispersed in 20 g of trimethylolpropane triacrylate (28) until homogeneity (“acrylate component”). 2 g of BaSO4 and 0.74 g of SiO2 were dispersed in 20 g of 2,3,6,8-Tetra(2-mercaptoethyl)-2,4,6,8-tetramethylcyclotetrasiloxane (21) and mixed until homogeneity (“thiol component”). 300 mg of SiO 2 and 2000 mg of BaSO4 were dispersed in 6000 mg (49.86 mmol —SH) of 2,3,6,8-Tetra(2-mercaptoethyl)-2,4,6,8-tetramethylcyclotetrasiloxane (21) (“thiol component”). Then 637.3 mg (3.99 mol —NH2) of trimethylolpropane tris [poly(propylenglycol), amine terminated]ether (“TPGA”) was added to the thiol component and mixed thoroughly (“thiol component”/TPGA mixture). 110 mg of SiO 2 and 1406 mg of BaSO4 were dispersed in 8531 mg (49.86 mmol C═C) of 1,1,1-tris(hydroxymethyl)propane-tris(1-methyl itaconate) (“itaconate component”) (33). 2800 mg (26.11 mmol —C═C—) of commercially available trimethylolpropane triacrylate (28) was mixed homogenously with 100 mg of (1.06 mmol —NH 2) triethylamine (“acrylate component”). 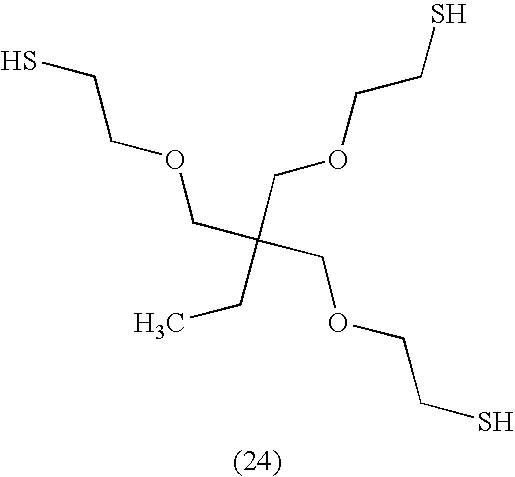 Then, 3200 mg (26.11 mmol —SH) of 2,3,6,8-Tetra(2-mercaptoethyl)-2,4,6,8-tetramethylcyclotetrasiloxane (21) (“thiol component”) was added to the “acrylate component” and the dispersion was mixed until homogeneity was reached. 800 mg of (6.653 mmol —C═C—) 1,1,1-tris(hydroxymethyl)propanetris(1-methyl itaconate) (33) was mixed homogenously with 33 mg (0.33 mmol —NH 2) of triethylamine (“itaconate component”). 3570 mg (23.56 mmol —C═C—) of 1,1,1-tris(hydroxymethyl)propane-tris(1-methyl itaconate) (33) was mixed homogenously with 92 mg (0.94 mmol —NH 2) of triethylamine (“itaconate component”). 2829 mg (23.56 mmol —SH) of 2,3,6,8-Tetra(2-mercaptoethyl)-2,4,6,8-tetramethylcyclo-tetrasiloxane (21) was added to the “itaconate component” and mixing was continued until homogeneity was reached. 21 mg (0.21 mmol —NH 2) of triethylamine were added to and mixed with 567 mg (3.94 mmol —C═C—) of tetrakis(1-methyl-itaconyl)-triethylenetetraamine (32) (“itaconamide component”). 420 mg (3.94 mmol —SH) 2,3,6,8-Tetra(2-mercaptoethyl)-2,4,6,8-tetramethylcyclo-tetrasiloxane-(21) was added to the “itaconamide component” and mixing was continued until homogeneity was reached. 34 mg of SiO 2 and 289 mg of BaSO4 were dispersed homogenously in 1200 mg (11.09 mmol —SH) of 2,3,6,8-Tetra(2-mercaptoethyl)-2,4,6,8-tetramethylcyclotetrasiloxane (21). Then 84 mg (0.83 mmol —NH2) of trimethylolpropane tris [poly(propylenglycol), amine terminated]ether (TPGA) was added to the latter and the dispersion was mixed thoroughly (“thiol component”). 63 mg of SiO 2 and 531 mg of BaSO4 were dispersed homogenously in 2360 mg (1.09 mmol —C═C—) of 1,1,1-tris(hydroxymethyl)propane-tris(1-n-butyl itaconate) (30) (“itaconate component”). The “thiol component” and the “itaconate component” were combined and mixing of the combined mixture was continued until homogeneity was reached. Weight % SiO 2: 2.13; Weight % BaSO4: 17.98; Weight % of sum of donor and acceptor: 78.05; weight % base: 1.84. 20 mg of SiO 2 and 169 mg of BaSO4 were dispersed homogenously in 700 mg (6.47 mmol —SH) of 2,3,6,8-Tetra(2-mercaptoethyl)-2,4,6,8-tetramethylcyclotetrasiloxane (21). In a next step 49 mg (0.49 mmol —NH2) of trimethylolpropane tris [poly(propylenglycol), amine terminated]ether (TPGA) was added to the dispersion which was then mixed thoroughly. (“thiol component”). 48 mg of SiO 2 and 398 mg of BaSO4 were homogenously dispersed in 1767 mg (6.47 mmol —C═C—) of Trimethylolpropane tris [poly(propyleneglycol), itaconamide terminated] (34) (“itaconamide-component”). In the next step, the “thiol component” and the “itaconamide-component” were combined and mixing of the combined mixture was continued until homogeneity was reached. Weight % SiO 2: 2.16; Weight % BaSO4: 17.99; Weight % of sum of donor and acceptor: 78.3; weight % base: 1.56. 0.406 g of SiO 2 and 3.456 mg of BaSO4 were homogenously dispersed in 15 g (119.62 mmol —SH) of pentaerithritol tetrakis(2-mercaptoproprionate) (26) (“thiol component”). 0.387 g of silica and 2.9 g of BaSO 4 were dispersed in 12.91 g (119.62 mmol C═C) of trimethylolpropane triacrylate (28). Then 0.362 g (3.58 mmol —NH2) of triethylamine was added and mixed thoroughly (“acrylate component”) The acrylate component and the thiol component were combined and the combined mixture was mixed until homogeneity was reached. Weight % SiO 2: 2.24; Weight % BaSO4: 17.94; Weight % of sum of donor and acceptor: 78.8; weight % base: 1.02. 117 mg of SiO 2 and 978 mg of BaSO4 were dispersed homogenously in 4000 mg (28.27 mmol —SH) of 2,3,6,8-Tetra(2-mercaptoethyl)-2,4,6,8-tetramethylcyclotetrasiloxane (21). Subsequently 349 mg (2.2 mmol —NH2) trimethylolpropane tris [poly(propylenglycol), amine terminated]ether (TPGA) was added to the dispersion which was mixed thoroughly (“thiol component”). 115 mg of SiO2 and 965 mg of BaSO4 were dispersed homogenously in 4289 mg of (22.62 mmol —C═C—) of 1,1,1-tris(hydroxymethyl) propane-tris(1-methyl itaconate) (33) (“itaconate component). Weight % SiO 2: 2.15; Weight % BaSO4: 17.97; Weight % of sum of donor and acceptor: 76.66; weight % base: 3.23. 187 mg of SiO 2 and 978 mg of BaSO4 were dispersed homogenously in 4000 mg (28.27 mmol —SH) of 2,3,6,8-Tetra(2-mercaptoethyl)-2,4,6,8-tetramethylcyclotetrasiloxane (21). Subsequently, 349 mg (2.2 mmol —NH2) trimethylolpropane tris [poly(propylenglycol), amine terminated]ether (TPGA) was added to the latter and the dispersion was mixed thoroughly (“thiol component”). 184 mg of SiO 2 and 965 mg of BaSO4 were dispersed homogenously in 4289 mg (22.62 mmol —C═C—) of 1,1,1-tris(hydroxymethyl)propane-tris(1-methyl itaconate) (33) (“itaconate component). The “itaconate component” and “thiol component” were combined and mixing of the combined mixture was continued until homogeneity was achieved. Weight % SiO 2: 3.39; Weight % BaSO4: 17.74; Weight % of sum of donor and acceptor: 75.68; weight % base: 3.19. The range of bone volume fraction extended from 3.5 to 19.5%. Mean volume fraction of the control and the augmented group was not statistically different (n=24, p>0.43). The structural model index (SMI), the degree of anisotropy and the connectivity density were also comparable in the control and the augmented group (p>0.1). Since the distribution of morphological properties was bimodal, the results are presented for two separate ranges of volume fraction (VF): a low VF (n=5) and a high VF range (n=19) with a cutoff value of 10.0%. As shown in FIG. 1 a, the mean elastic modulus of the augmented specimens was not significantly higher than the one of the controls for both low and high VF(p>0.13). For low VF, the ultimate stress increased from 0.69±0.50 to 1.93±0.99 MPa due to augmentation (+180%), and for high VF it increased from 4.63±0.7 to 5.71±1.4 MPa (+23%). The increase in strength was found to be significant in both ranges (p<0.037). The other post yield properties, ultimate strain and total energy were also found to be higher in the augmented group (see FIG. 1b). A total of 84 cylindrical specimens (ø 8 mm, L=10 mm) were cored out under constant water irrigation from cadaveric human (three male and one female) thoracic and lumbar vertebrae with age ranging from 29 to 86 years. Half of the specimens were augmented with the composition of Example 15. Since there was no previous study investigating the fatigue behavior of human trabecular bone, a protocol was adapted from one described in the literature for bovine trabecular bone (Michel M. C. et al, 1993 , Journal of Biomechanics, 26, 453-463). During mechanical testing, the specimens were immersed in Hank's balanced salt solution at 37° C.
0.092 g of SiO 2 was dispersed homogenously in 2.4 g (20.19 mmol —SH) of Tris(3-mercaptopropyl)trimethylolpropane (24). Then, 0.636 g (6.05 mol —NH2) of diethanolamine is added to the thiol/SiO2 dispersion and mixed thoroughly (“thiol component”). 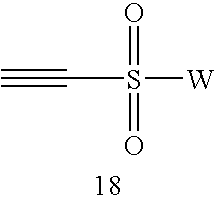 0.180 g of SiO 2 was dispersed homogenously in 7.067 g (20.19 mmol —C═C—) of polypropyleneoxide α-ω-bis(1-propyl itaconamide) (36) (“itaconamide component”). The “thiol component” and the “itaconamide component” were combined and mixed until homogeneity was achieved. Weight % SiO 2: 2.63; Gelation time: about 30 minutes at 37° C. At 70° C. the composition is stable for 60 days. The Young's modulus E at 0.1 strain is around 2 MPa; Water-uptake: 15%. 0.070 g of SiO 2 was dispersed homogenously in 2.400 g (19.14 mmol —SH) of pentaerythritol tetrakis(2-mercaptopropionate) (26) (“thiol component”). 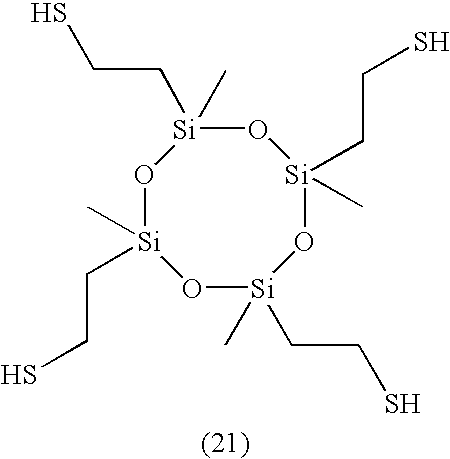 0.400 g of SiO2 was dispersed homogenously in 15.074 g (33.49 mmol —C═C—) commercially available poly(propylene oxide) diacrylate (35) (Sigma). Subsequently 0.191 g (0.957 mmol —NH2) of Jeffamine D-400 was added to the acrylate/SiO2 dispersion and mixed thoroughly (“acrylate component”). The “thiol component” and the “acrylate component” were combined and mixing was continued until homogeneity was achieved. Weight % SiO 2: 2.59; Gelation time: about 30 minutes at 37° C. At 37° C. the composition was stable for more than 250 days; Young's modulus E at 0.1 strain: 0.2 MPa. Water-uptake: 10%. 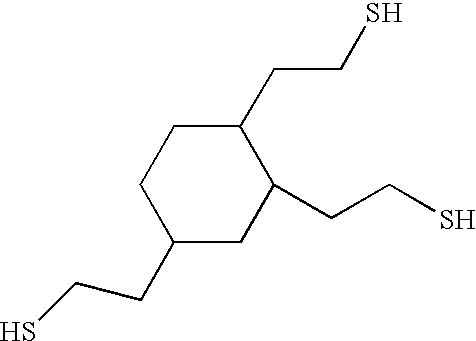 0.030 g of SiO 2 was dispersed homogenously in 1.100 g (11.64 mmol —SH) of 1,2,4-Tris(2-mercaptoethyl)cyclohexane (22) (“thiol component”). 0.130 g of SiO 2 was dispersed homogenously in 4.891, g (13.97 mmol —C═C—) of polypropyleneoxide α-ω-bis(1-propyl itaconamide) (36). In a next step 0.116 g (0.957 mmol —NH2) of Jeffamine D-400 was added to the itaconamide/SiO2 mixture and mixed thoroughly (“itaconamide component”). The “itaconamide component” and the “thiol component” were combined and mixing was continued until homogeneity was achieved. Weight % SiO 2: 2.55; Gelation time: in about 30 minutes at 37° C. Stability ≧1 year at 37° C.; Young's modulus E at 0.1 strain is around 1 MPa. Water-uptake: 12%. 0.070 g of SiO 2 was homogenously dispersed in 2.2 g (17.27 mmol —SH) of Tris(3-mercaptopropyl)trimethylolpropane (24). Subsequently 0.544 g (5.18 mol —NH2) of diethanolamine was added to the thiol/SiO2 mixture and mixed thoroughly (“thiol component”). 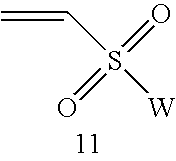 0.140 g of SiO2 was homogenously dispersed in 5.182 g (17.27 mmol —C═C—) of polypropyleneoxide α-ω-bis(acrylamide) (37) (“acrylamide component”). The “thiol component” and the “acrylamide component” are combined and mixing continued until homogeneity. Weight % SiO 2: 2.58; Gelation time: in about 30 minutes at 37° C. At 70° C. the composition is stable for 60 days; Young's modulus E at 0.1 strain is around 2 MPa. Water-uptake: 17%. wherein the first and second precursor components crosslink at physiological temperatures over a period of time following application. 2. The method of claim 1 wherein the hard tissue is at least one vertebra. 3. 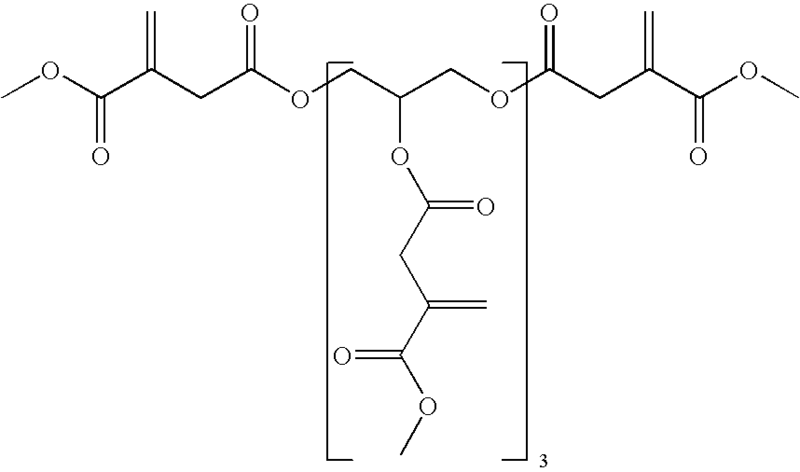 The method of claim 1 wherein the first and second precursor components are selected from the group consisting of monomers, oligomers and polymers. 4. The method of claim 3, wherein the first and the second precursor components are monomers. 5. The method of claim 1 wherein the first precursor component and the second precursor component form the covalent linkages by a Michael addition reaction. 6. The method of claim 1 wherein the nucleophilic groups of the first precursor component are selected from the group consisting of thiols and amines. 7. The method of claim 1 wherein the electrophilic groups of the second precursor comprise conjugated unsaturated groups. 8. 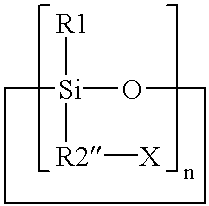 The method of claim 1 wherein the first precursor component is a siloxane. 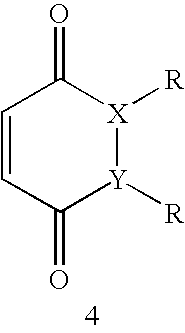 wherein n=3-6, R1=alkyl, R2″=(alkyl, and X=—SH or —NH2. 10. The method of claim 9 wherein the cyclosiloxane is 2,4,6,8-Tetra(2-mercaptoethyl)-2,4,6,8-tetramethylcyclotetrasiloxane. 11. 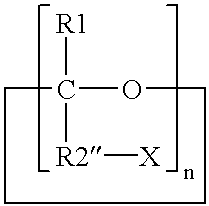 The method of claim 7 wherein the conjugate unsaturated group comprises at least one acrylate group. 12. 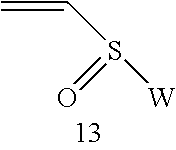 The method of claim 11, wherein the first component comprises a siloxane having at least one thiol as a nucelophilic group. 13. 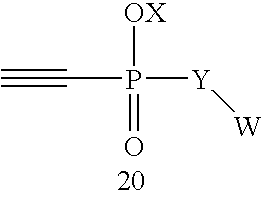 The method of claim 1 wherein the second precursor component is selected from the group consisting of derivatives of 1,1,1 tris(hydroxymethyl)propane, derivatives of pentaerithritol and derivatives of triglycerol. 14. 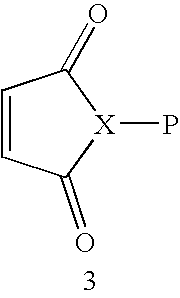 The method of claim 13 wherein the second precursor component is trimethylolpropane triacrylate. 15. The method of claim 1, wherein the composition further comprises one or more additives selected from the group consisting of thixotropic agents and radiopaque agents. 16. 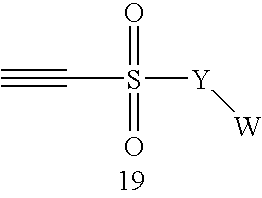 The method of claim 15, wherein the additive is barium sulfate. 17. The method of claim 1, wherein the composition further comprises a base. 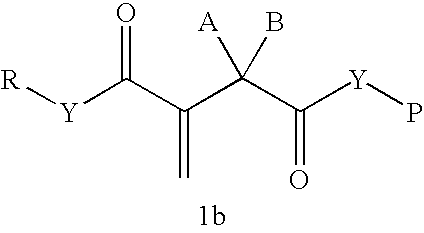 wherein the conjugated unsaturated groups comprise at least one acrylate. wherein n=3-6; R1=alkyl; R2″=alkyl; and X=—SH or —NH2. 20. 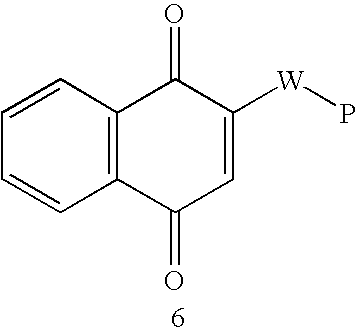 The biomaterial of claim 19 wherein the cyclosiloxane is 2,4,6,8-Tetra(2-mercaptoethyl)-2,4,6,8-tetramethylcyclotetrasiloxane. 21. 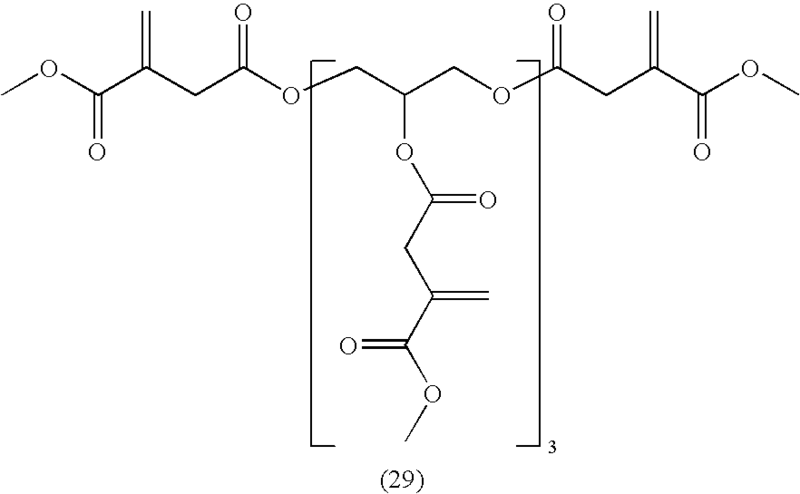 The biomaterial of claim 18 wherein the second precursor component is selected from the group consisting of derivatives of 1,1,1 tris(hydroxymethyl)propane, pentaerithritol and triglycerol. 22. 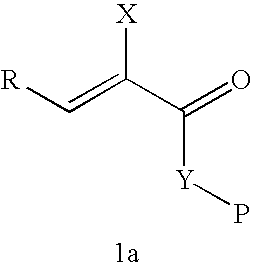 The biomaterial of claim 21 wherein the second precursor component is trimethylolpropane triacrylate. 23. The biomaterial of claim 18, wherein the composition further comprises one or more additives selected from the group consisting of thixotropic agents and radiopaque agents. 24. 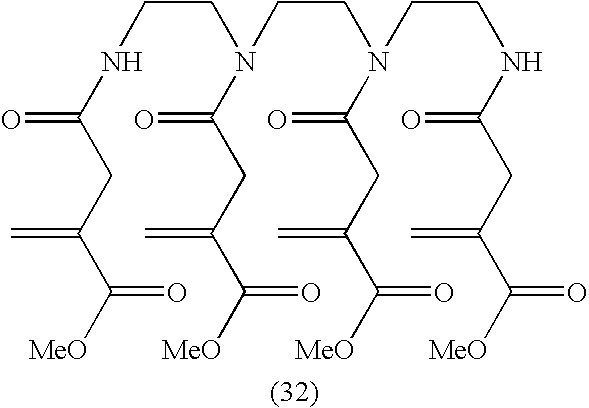 The biomaterial of claim 23, wherein the additive is barium sulfate. wherein the first and second precursor components crosslink at physiological temperatures to form a biomaterial. 26. The kit of claim 25 wherein the first precursor component is a siloxane. wherein n=3-6; R1=alkyl; R2=alkyl; and X=—SH or —NH2. 28. The kit of claim 27 wherein the cyclosiloxane is 2,4,6,8-Tetra(2-mercaptoethyl)-2,4,6,8-tetramethylcyclotetrasiloxane. 29. The kit of claim 25 wherein the second precursor component is selected from the group consisting of derivatives of 1,1,1 tris(hydroxymethyl)propane, pentaerithritol and triglycerol. 30. The kit of claim 29 wherein the second precursor component is trimethylolpropane triacrylate. 31. The kit of claim 25, further comprising one or more additives selected from the group consisting of thixotropic agents and radiopaque agents. 32. The kit of claim 31, wherein the additive is barium sulfate. 34. 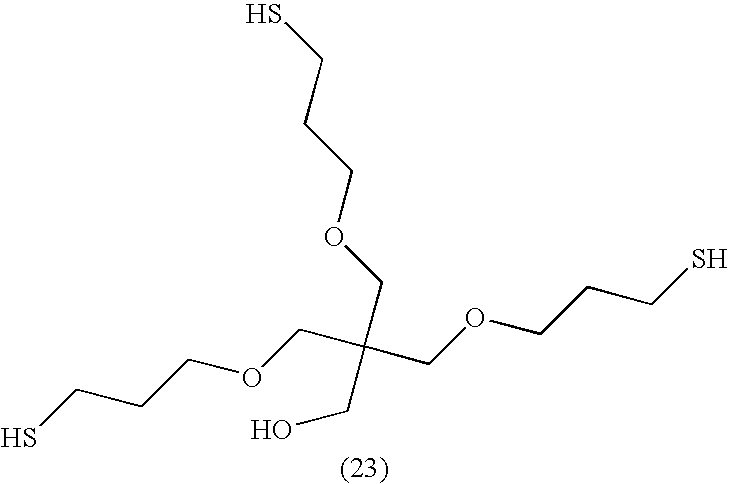 The method of claim 28, wherein the composition further comprises an additive selected from the group consisting of thixotropic agents and bioactive factors. 35. The method of claim 33 wherein the first precursor is a siloxane. 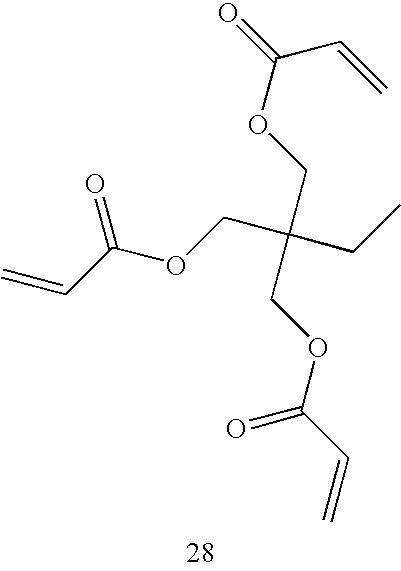 ES2294305T3 (en) 2008-04-01 Derived hyaluronic acid ester for the preparation of hydrogel materials by photocuring.